yeah i do know. have to do that later as i am not home. will post as soon as i get home. Looks good but you got the spd tab showed twice. Did you mean to show the memory tab in one of the cpuz shots? What are your core temps at load? Just remember to keep them under 80c for 24/7 use. ohhh yeah sorry I over looked that you had 2 kits. 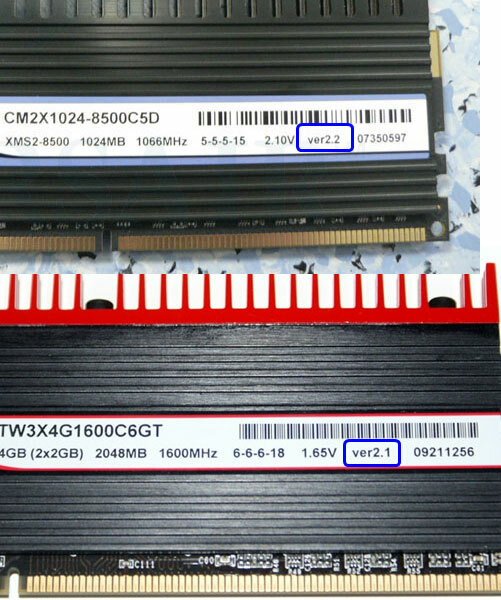 Thanks for the SPD images, can you please look at the stickers on each set of memory and tell us the version number. Thank you! That is probably the reason you have a tough time overclocking those together, they are very different IC's! The better of the two kits would be the 2.1 version, the 3.1a may not clock as high or allow as tight timings as the 2.1 version. You could set 999-24 and should be able to at least get 1866 going though I'd imagine, what all have you tried already? Report on the 4G issue has been sent, I'll let you know when I hear back! if we try a [email protected] first then if its all is going to hell we could try with only 6gb and 7-9-7/8-9-8 at 2000mhz?